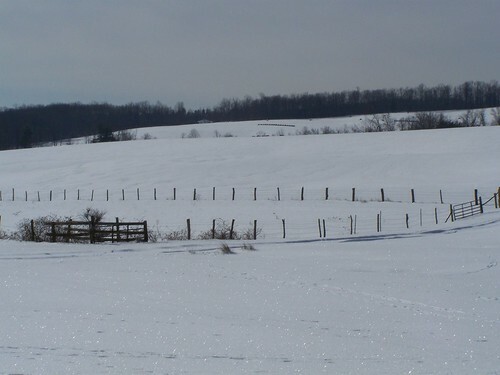 A picture of the field.� I was hoping it would show how the sun was glistening off the snow.� It was absolutely beautiful. 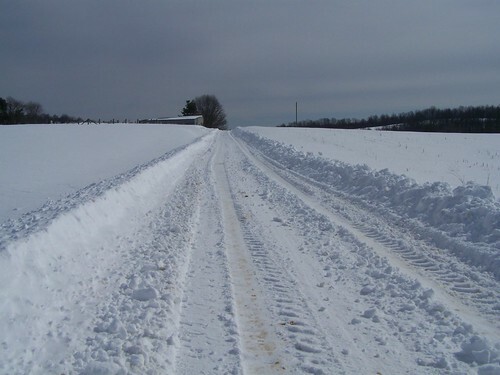 Our road after the tractor had made a path. 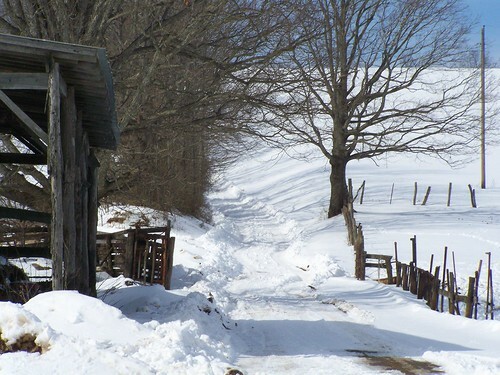 Going up the hill beside the hay barn.� Yes, that brown spot proves there is still dirt under all this snow. 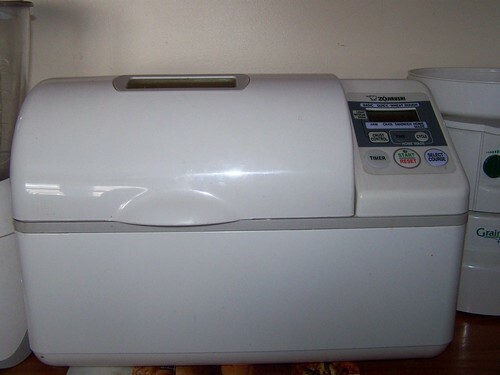 I bought it used several years ago and consider it a very valuable helper.� I put 1 cup lukewarm water into the machine, 1/4 cup butter-cut into chunks, 1egg beaten, 3 1/4 cups bread flour, 4 tbsp sugar, 3 tbsp powdered milk, 1tsp salt, 1 1/2 tsp yeast.� Set the machine to dough cycle and walk away.� It takes the machine l hr 50 min. to run through this cycle.� Then I take the dough out, punch it down and form the rolls.� I get about 15 rolls from 1 batch.� Then I spray them with olive oil and let them rise for about 1 hr.� Bake 12 min. at 425 degrees.� When I take them out of the oven, I brush them with melted butter(being generous with the butter).� Half of these never make it to the table.� They get eaten as soon as the butter is spread on them.� One thing I do a little different from this recipe is I put 1 1/4 cup fresh ground wheat flour and 2 cups bread flour instead of using all bread flour.� My family doesn’t care a lot for whole wheat so I mix it.��I guess I better go check on my rolls and get ready for company.� God Bless.